Over his decades in public life, Trump has faced scant — if any — serious consequences for saying things that are not true. However, right now, in putting together his answers for the special counsel, that all changes. P.S. Trump also said yesterday — following a federal court victory for CNN's Jim Acosta, who returned in triumph (photo above) with his access restored — that the White House is "writing up rules and regulations" for reporter "decorum." "And if they don’t listen to the rules and regulations, we’ll end up back in court and we’ll win," Trump said. "But more importantly, we’ll just leave, and then you won’t be very happy, because we do get good ratings." "You can’t take three questions and four questions, and just stand up and not sit down. Decorum. You have to practice decorum. ... We want total freedom of the press ... But you have to act with respect. You’re in the White House." 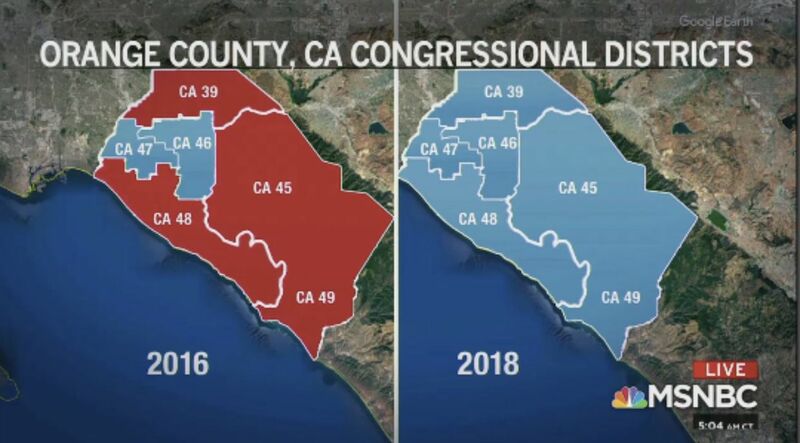 Again?! 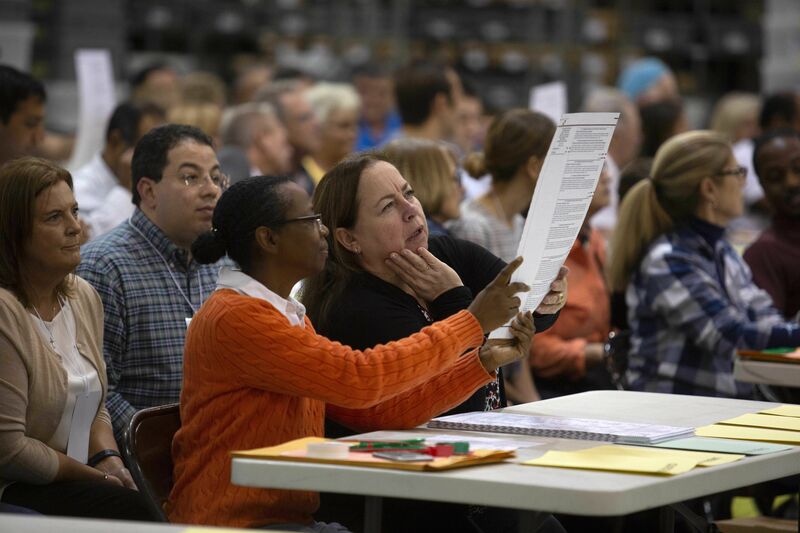 Below, volunteers look at ballots during a hand recount in Palm Beach, Fla. yesterday. "[T]he CIA examined multiple sources of intelligence, including a phone call that the prince’s brother Khalid bin Salman, the Saudi ambassador to the United States, had with Khashoggi." "Khalid told Khashoggi ... that he should go to the Saudi consulate in Istanbul ... and gave him assurances that it would be safe to do so." "Among the intelligence assembled by the CIA is an audio recording from a listening device that the Turks placed inside the Saudi consulate." "A theory the CIA has developed is that Mohammed believed Khashoggi was a dangerous Islamist who was too sympathetic to the Muslim Brotherhood." Be smart, from Jonathan Swan: Assuming this is true, this will be another test of whether Trump is willing to accept the politically inconvenient conclusions of his own intelligence community over lies and cover stories from abroad. 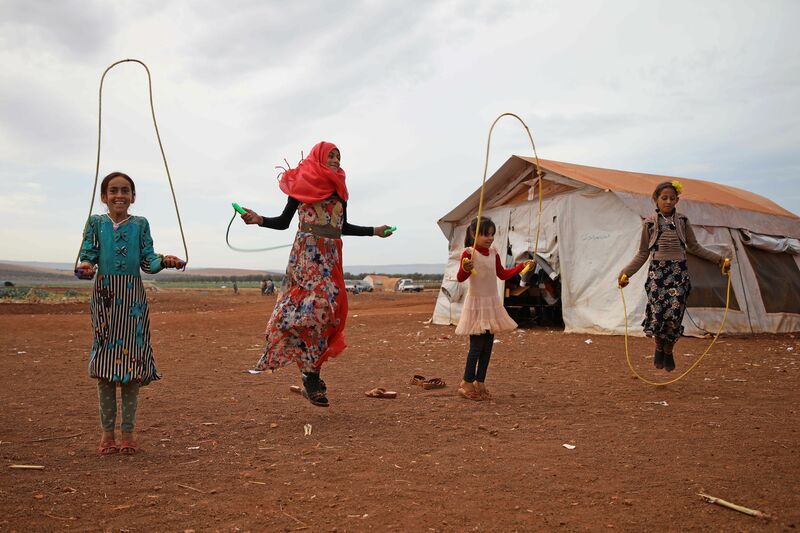 Syrian children, who fled civil war with their families, jump rope in the yard of the makeshift school Zuhur al-Mustaqbal (in Arabic: "Flowers of the Future") in a camp for displaced people in Syria's mostly rebel-held northern Idlib province. "Nearly 200 miles [south of Paradise], in San Francisco, the smoke was so thick that health warnings prompted widespread school closings. Even the city’s cable cars were yanked from the streets." 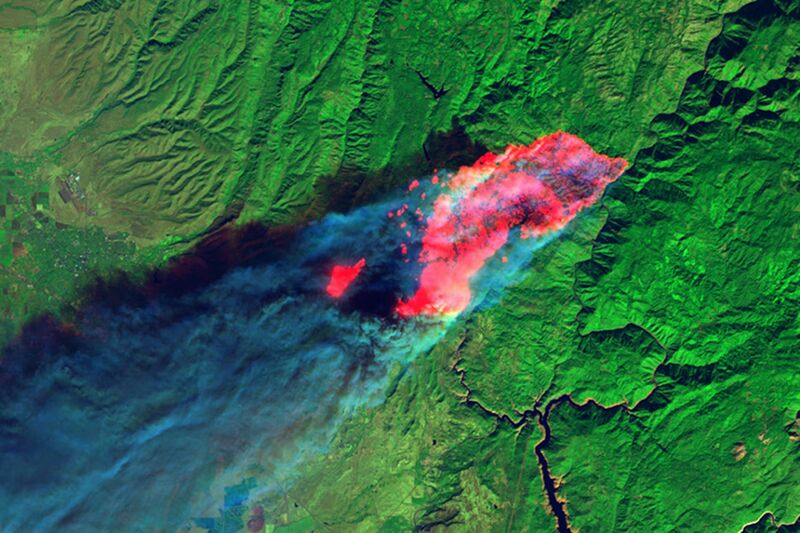 Why it matters: "[R]esearchers warned that as large wildfires become more common — spurred by dryness linked to climate change — health risks will almost surely rise." 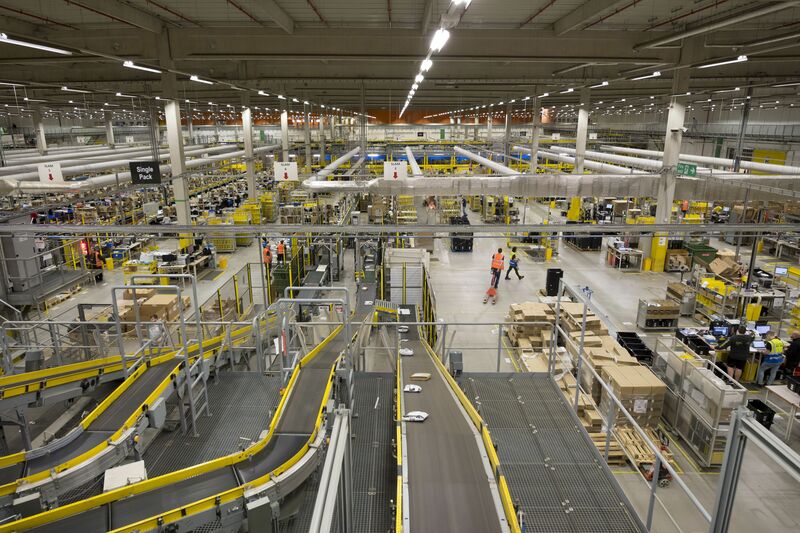 "Amazon is not too big to fail. ... In fact, I predict one day Amazon will fail. Amazon will go bankrupt. If you look at large companies, their lifespans tend to be 30-plus years, not a hundred-plus years." "If we start to focus on ourselves, instead of focusing on our customers, that will be the beginning of the end. ... We have to try and delay that day for as long as possible." 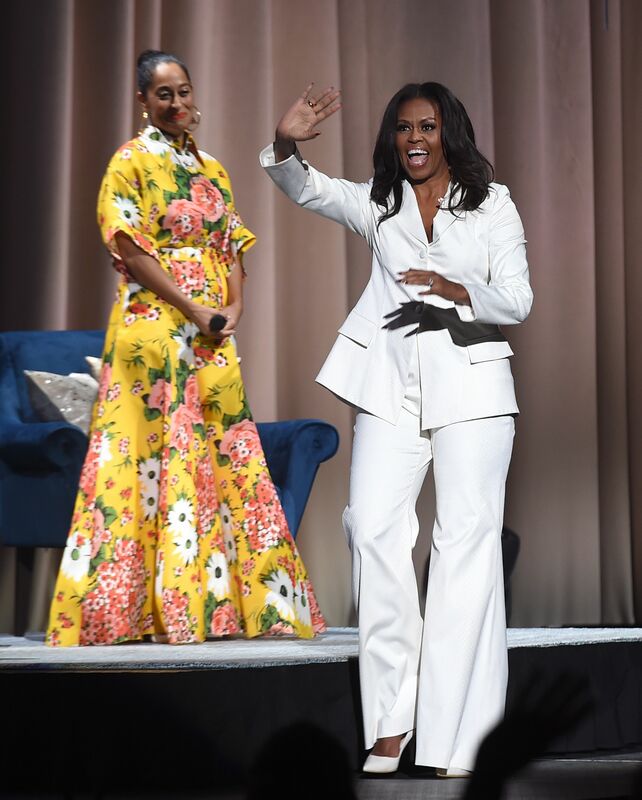 "First day sales for Michelle Obama’s 'Becoming' topped 725,000 copies, making it one of the year’s biggest debuts," per the AP. "'Becoming' had the biggest opening of any books in 2018 by Crown’s parent company, Penguin Random House. But at least one other book this year, from Simon & Schuster, did start higher: Bob Woodward’s 'Fear: Trump in the White House' sold around 900,000 copies after one day." The book "is well exceeding the pace of previous memoirs by first ladies. In 2003, Hillary Clinton’s 'Living History' had first week sales of around 600,000 copies, at a time when audio sales were tiny and e-book sales nonexistent."